Apparently the May 5th AV referendum is a complete yawn-fest – everyone is saying it. But are we losing out by ignoring our big moment? The reformist argument for not voting AV seems to be: “If I don’t vote for AV the government will know I’m doing this in protest, because I wanted proportional representation“. Well, the world is a crazy place and simple choices are sometimes simpler than they look. I voted Lib Dem and I got a Lib Dem government. I just got a Tory government as well. Likewise I wanted proportional representation but what I am being offered is AV. Firstly, what is this AV / FPTP malarkey? In the above example you can substitute Left Wing and Right Wing, or Pro-A-Thing-We-All-Like and Anti-A-Thing-We-All-Like for Pubs and Coffee. The AV system is essentially run by getting us to pick our top-three favourites out of a longer list than we are used to (I think..) and picking the guy that gets the most votes – whether they be someones first, second, or third choice. At least it would be genuinely someone the majority of us liked. I know we wanted PR, but what’s wrong with a step in the right direction? Currently your vote is added to all the votes in your area and then your area counts as ‘one’ (you and your ten neighbours’ votes in, say, the outer Hebrides counts as ‘one’, my and my several million neighbours in South East London’s votes count as ‘one’). 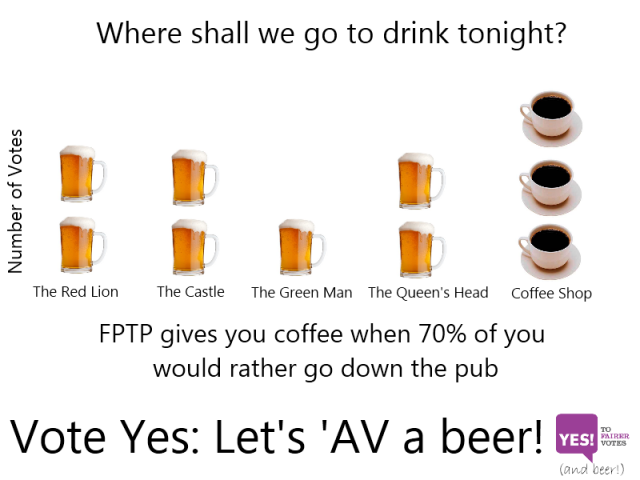 AV is one thing, Proportional Representation is another. You could have one, the other, or both at the same time. From the word go this referendum has been derided as incomprehensible, pointless and yawn-worthy. Why? We asked for voting reforms and now we have the chance to have voting reforms. Why aren’t we jumping for joy? Yes AV is different from PR, no it isn’t all that more complicated than the current system, and if we turn down the first referendum of any kind in 35 years we may never get a second chance. We have to eat what we’re given (as it were) and if AV is all we are being offered then why not say thank you and vote it in. After all, if you ask for a pay rise and get a bonus instead, you don’t turn down the bonus just to make a point. Your boss might argue that they tried to meet you half way but you weren’t interested. In other words, we asked for voting reforms – and the government are offering voting reforms. Not voting will be a sign that voting reforms are no longer worth talking about. It’s going to take a very long time for anyone to get anything near exactly what they want (the coalition being a great dying dinosaur of a case in point) but then, that’s Democracy folks! Whether you vote yes or not, it’s a vote worth having. BoneJangles Esoteric skeletons discuss philosphy. Grand. Joe Decie Short, stunning, wee comics! Robin Brown Tumbles Funny little things! The Annotated Weekender the best idea for a comic strip, ever. Rebel Without A Pause Fresh bits and bobs from grime to hip hop and on! The Doll Says crazy-funny London lady.